Morgan Stanley’s Rashique Rahman believes that the credit ratings for developed markets are set to crater both this year and next, as shown below. 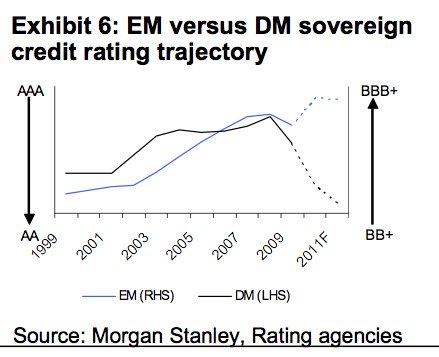 Meanwhile, perceived credit risk (via ratings) in emerging markets should hold its ground. Consider the trajectory of underlying sovereign credit fundamentals for EM and DM. Our work points to a steady deterioration in DM sovereign creditworthiness against a moderate improvement for EM sovereign creditworthiness – based on our Sovereign Credit Rating Model (SCRM) results. 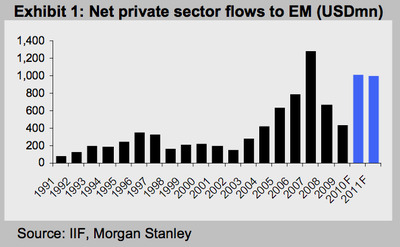 One implication is that Mr. Rahman sees the potential for a surge of investment inflows into emerging markets.